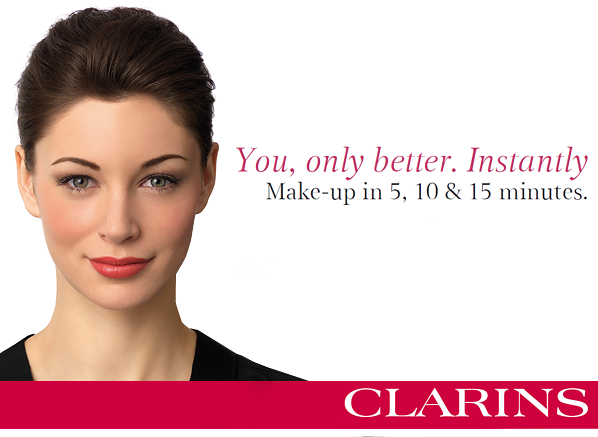 Clarins Make-Up – You, only better. Instantly. Clarins knows that a touch of make-up can help you feel ready to face the world. But you don’t need to spend hours creating the perfect look; all you need is 5, 10 or 15 minutes, and a great selection of products. Clarins Make-up perfectly complements your busy lifestyle, with easy-to-use products in luxurious formats that take the guess work out of looking radiant and polished. Build your look with items that fit into your existing make-up collection and give the best results when time is of the essence. It’s the ultimate Get The Look, tailored to suit you! Watch the tutorial: Clarins: You, only better. Instantly. – BB Skin Perfecting Cream SPF25 Apply using your fingertips, warming the product onto your skin with gentle smoothing motions. Work from the middle of the face outwards, remembering blend properly at your neck area. – Multi Blush Apply with one clean finger, blend with another! The cream turns into a powder finish upon application, leaving a soft glow. – Be Long Mascara This’ll make your eyes look instantly vibrant and wide awake. Wiggle the wand from the bottom of the lashes to the tip. This special formula also contains a lash boosting complex to enhance the look of your natural lash line. – Instant Light Natural Lip Perfector The perfect all-rounder. Apply the soft balm to the lips for a nourished, plumped pout with a hint of colour. – Instant Light Radiance Boosting Complexion Base The ideal base for your foundation or BB Cream. Smooth from the middle of the face outwards for flattering radiance. – Instant Concealer Warm between fingertips and pat onto the undereye area. It’s lightweight so it won’t crease, while still offering fantastic coverage. – Ombre Minerale Eye Shadow This mineral based shadow offers a soft wash of colour across the lid. Blend outwards to create a more natural look. – Crayon Khol Eyeliner Pencil Eyeliner offers instant definition without fuss. Draw this pencil across the upper lash line and gentle blend using the brush tip. When time’s well and truly on your side, dare to be a little bolder. Still natural-looking and completely wearable, but with a chic, refined finish. – Instant Smooth Perfecting Touch For a super smooth and flawless base, start with this little pot of wonder. Pores and wrinkles are visibly smoothed, and your foundation will last longer. – Skin Illusion Natural Radiance Foundation SPF10 Substitute your BB Cream for the lightweight, radiant coverage of Skin Illusion. It’ll cover imperfections while looking completely natural. – Instant Light Brush-On Perfector Brighten up dark circles and signs of fatigue with this hybrid concealer/highlighter. Dab on and blend for wide-awake eyes. – Eyebrow Pencil Add a little definition and enhance the natural curve of your brow. Use light, short strokes. – 3 Dot Liner This handy pen makes lining easy, filling in a sparse lash line in a simple sweep. – Rouge Eclat Lipstick A nourishing, comforting pop of colour that lasts. It does have a brightening effect on the face, once I got used to where to apply and how much, and dabbing to blend, no instructions with it, (followed Lulu's advice from her make up tips). I use it everyday now and would definitely buy it again. This entry was posted on Wednesday, July 23rd, 2014 at 2:12 pm and is filed under Get the Look, Make-up, Trends, Video. You can follow any responses to this entry through the RSS 2.0 feed. You can skip to the end and leave a response. Pinging is currently not allowed.